Life in Regency England is not as simple as it seems—for all its demure behavior and propriety, harsh consequences and unforgiving attitudes also abounded. Rowan Haydn, a once wealthy man of the Gentry, and Lydia Tyrone, a proper and polite shopkeeper’s daughter, find themselves in precarious situations out of their control during a time when having no control meant your fate was in another’s hands. Opposites in every manner of the word, Lydia and Rowan form a strong bond during the months that Rowan works for her father in their family’s clock-repair shop. A handsome young man with a secret to hide, Rowan uses his time with the Tyrones to turn his life around–from unfortunate choices that Lydia yearns to know about but that Rowan is desperate to keep his own. Rowan feels that his past mistakes ensure he will always be looked upon in disdain by God and his peers, despite a privileged pedigree that normally protects the Gentry from being pushed aside. In never expecting a wealthy gentleman to find himself in the situation that brought Rowan to his present state, Lydia unintentionally places herself below Rowan because the class structure of Regency England dictates that the Gentry cannot form relationships with working-class individuals. Both Lydia and Rowan comprehend that God places no value on social standing or past mistakes, and yet both of them fall prey to the belief that they are only as good as society deems them because that status states their offerings to others. When an unexpected and devastating event brings about feelings that Lydia and Rowan did not want to acknowledge, both have to decide if they are willing to put aside society’s conventions for a relationship that defies the odds and proves that God’s love is the one that matters most. 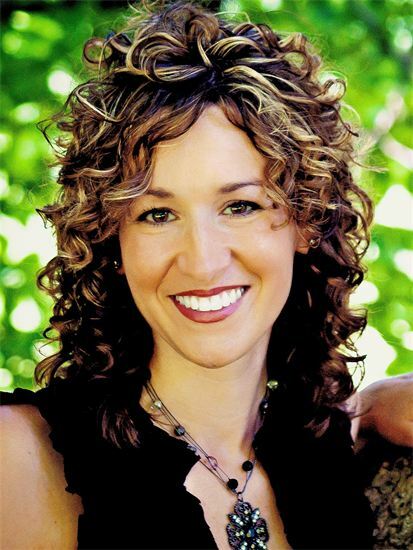 Author Becky Riker brings societal analysis, family drama, and personal hardship and growth in the inspirational romantic story With Empty Hands. A novel of redemption, love, and acceptance, Riker’s novel shows that every person is worthy of God’s mercy—no matter their past mistakes—because what matters to Him is one’s willingness to surrender their life out of love for His son. 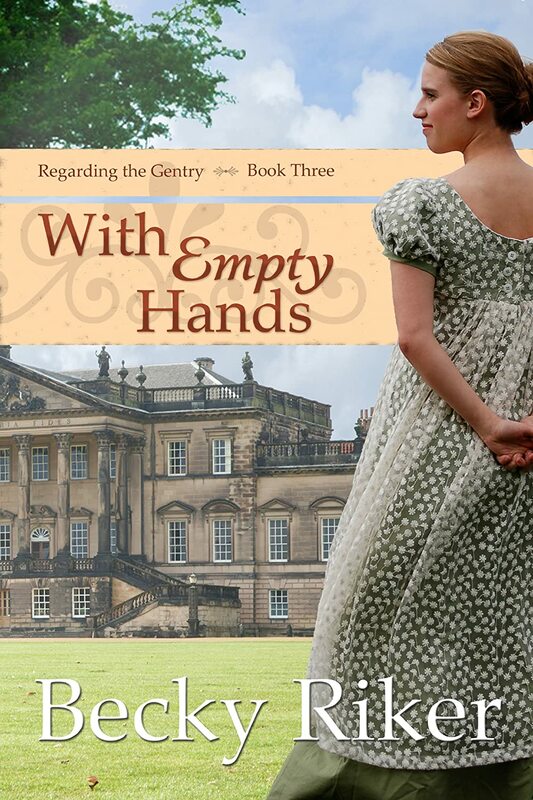 The third novel in Riker’s Regarding the Gentry series, With Empty Hands has every aspect a reader wants from a Regency novel: class differences, flowery language, a community of characters that love family drama, romances that seem destined for challenges, fiery females, and heroic males. Riker’s strongest point in this novel is her ability to create characters that are flawed but loveable, wholly human and relatable, and strong in their faith without being preachy. Lydia and Rowan, as the protagonists of With Empty Hands, draw readers into their situations with simple but deep emotions that create heart-wrenching scenes. Rowan is heroic with his genteel background and love for Lydia. Readers will cheer for him as he valiantly comes to understand God’s love for him and make amends for his past mistakes. His courtly behavior and respect for Lydia’s father make Rowan one of Christian fiction’s most admirable heroes. Lydia, like her counterpart, is an equally intriguing character because she defies Regency standards for female characteristics. An upstanding lady who challenges those around her with sarcastic wit but humble dialog, Lydia epitomizes Christian female behavior as she takes care of her father and follows God’s law for how women should act. She stands her ground with Rowan about the propriety of men and women’s interactions, but Lydia is not afraid to form a friendship with him. She is a good example for female readers of the proper way for modern ladies to become strong and independent, but still humble, around men. If With Empty Hands has a fault, it is that the novel is too short for true character development to occur. Riker’s novel has much possibility for in-depth characterization that its short length does not do the story or its characters justice. With Empty Hands is a good novel—I wanted more! Rowan’s relationship with God, for example, is hardly touched upon after he makes his decision about where he wants the relationship to go. Riker’s novel is an inspirational one, so Rowan and Lydia’s relationships with God—and subsequently how their relationships with God affected their romantic relationship—should have factored into the storyline much more than was actually placed into the text. The negation of this subject after the first third-or-so of the novel left a void in the story because it suddenly felt that the faith aspect of Lydia and Rowan’s lives were no longer important, even though the Tyrone and Haydn families claimed to be saved by Jesus. A little extra length to With Empty Hands would have gone a long ways to making the story into a fully compelling novel. Riker’s novel is good regardless of whoever picks up the novel because her love for the time period and genuine desire to reach people through God’s salvation translates through characters and settings with ease. The three-hundred-year difference between Regency and present day makes little difference to empathizing and sympathizing with her characters. However, historical fiction readers will love With Empty Hands for its classic flowery language that instantly brings to mind characters in pale muslin dresses or breeches and cravats. 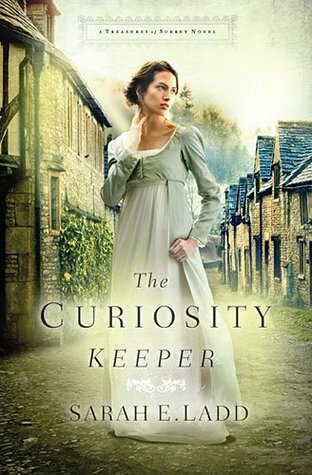 Riker’s novel also stands out amongst other Regency stories because the context within which she sets her story is a bit darker than most—Dickensian, if you wish, for those who have read the Victorian author’s Little Dorritt. With Empty Hands is the third novel in Riker’s Regarding the Gentry series but can be read as a stand-alone novel; however, the story will be more fulfilling if the first two novels are read beforehand.